This is what my father’s privileged life has come down to: Every five seconds or so he emits a sonorous humming noise, making him sound like a ship in deep fog. Which, of course, he is. Mom and I are visiting him, a duty she performs several times a week, and we’ve wheeled him to the first-floor library, where we feel less on display and can breathe through our noses. 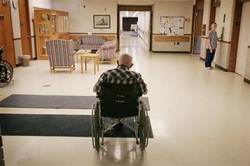 Even though he has a private room in the most exclusive, attentive, criminally expensive nursing home in suburban Philadelphia, the faint scent of soiled diaper permeates every part of the floor. “Herm, do you have everything you need?” my mother asks, placing her lacquered lips next to his hair-tufted earhole, as though his inability to respond to questions is just a matter of volume or positioning. Her hands are balled into little fists atop the Jimmy Choo handbag that lies across her lap. My own purse, which sags on the floor at my feet, I got off eBay. “Hmmmmmmm,” my father intones, his eyes as empty as a plundered tomb. There is, in my mom’s attentions, some of the goofy magical thinking she is noted for. I’m convinced she believes that, given proper care, Alzheimer’s has been known to clear up like pneumonia, that Dad will return to us good as new. She delves into her bag for an oversized Snickers, which she hands to my father. He attacks the wrapper with what seems like seventeen fingers before biting greedily into the bar. This effectively stops his nerve-wracking monotone for a moment. My mother reaches down and brushes off my father’s sweat pants. The bottoms have been rolled up into cuffs. My father has always been a tall, imposing man, but he has lost some height recently, so his pants now puddle around his Velcro-bound sneakers, even when sitting. The impression I have is that he is gradually melting like a glacier. The effect is enhanced because his arms are as freakishly long as ever, and, given that one of his hands is currently pushing candy bar into his mouth like a banana, he also reminds me, for the moment, of some arboreal ancestor. Needless to say, there is very little left of the legendary scholar who for nearly four decades has electrified the literary world with his highly acclaimed histories. It is this standing that is currently under attack, and I have come to town to bolster my mother, who is wilting under the media blitz. My father, of course, is blissfully unaware of the bloodhounds on his trail. To avoid his unsettling resemblance to a gibbon, I turn to the library’s cherrywood shelving and the books arrayed there. Incredibly, I see one of his. “Mom, look here.” With one of the skaggy fingernails she’s jumped on me about since high school I point to the familiar dust jacket. My mother’s loyalty to my dad runs deep. Inordinately critical of everyone else, she subscribes to a cult of personality where he is concerned. This has caused her to see him now in a Shakespearean light, a colossus besieged by petty men. I take the book down. It is volume two of his set on the collapse of the Soviet Union. I crack it open to a page of photos and there is Mikhail Gorbachev, in full color, staring out at me. The word choice is so uncharacteristic of my mother that I am jolted. “I’m sorry, kitten,” she says. Her eyes are starting to glisten at the corners. I ponder this math. There’s little question that the culture is growing ever more intolerant of human screw-ups. The rush to trash any and all reputations has become a blood sport, and soon no one on the planet will escape his or her fifteen minutes of shame. But you have to balance this against the fact that they may have a point in my father’s case. It hurts me to admit it, but the charges against him are not easy to brush aside. I’d love to make my mother recognize this without her turning on me. The Snickers consumed, Dad starts his plainsong again. I study his face. One can read into its terrible vacancy a certain peace. But is that peace the legacy of a clear conscience, or his realization, as he began his downward slide, that certain secrets would follow him to the grave? Of one thing there is no doubt: it’s a face no longer of this world. Corazon, his Filipino caregiver, has lovingly shaved him and blow-dried his remaining hair, but the process already seems less like grooming than the cosmetic trickery of the undertaker. Dad’s jaw is now level with his top shirt button. A prodigious strand of spittle waggles ominously from his lower lip, threatening his shirt with each hum. While it’s hard to think of him as the brilliant person he once was, it’s even harder to understand how such a prodigious intellect can so easily evaporate. Of course, its imprint still remains. I prefer to think of the intellect as a tree --- a rambling old banyan, say, that’s left countless seedlings behind to take root. I have only to look down at Dad’s book, where thoughts, analyses and arguments by the score are pressed between pages waiting to be crossbred with the ideas of minds yet to come. Here are his assessments of Gorbachev, Yeltsin, Walensa, a trenchant litany of their triumphs and failures, reminders that greatness and imperfection are inescapably joined at the hip. I glance down at Gorbachev, the familiar cinnabar birthmark staining his brow. Is he not the physical embodiment of that troublesome package deal? My gaze returns to Dad. Painful as it is, the question must still be asked: Are you indeed guilty, O Father of mine? Have decades of work been undone by a bit of ill-considered corner-cutting? All at once, my lungs constrict. Take five, Iris, you’re starting to freak out. I tell my mother I have to pee and set off at a slight trot in my klutzy wedges. She frowns at my urgency, as if I am no longer her thirty-eight-year-old spinster daughter, but a five-year-old who has forgotten herself again. Once inside the ladies room, a designer’s fantasy with its sleek, crouching panther of a toilet, black wall tile, and gold hardware, I stand with my back against the door, chest heaving. It seems unbearably sad that he cannot grasp the accusations. Otherwise, we could simply ask him. He might or might not own up, could even make a public apology. This way, he’s like an empty chair at a political debate. It does have its positives. He’s beyond punishment. He’d be horrified by the prospect of literary disrepute. But it calls to mind those bloody ex-dictators who’ve been judged incompetent to stand trial for crimes against humanity. You must be able to grasp your sins in order to answer for them, we say. That makes dementia a refuge that puts you beyond the reach of justice. But where do your sins go? And at day’s end, who is to pay for them? I splash cold water over my face. On the other side of the gold washbasin my reflection confronts me. The mirror seems to have unusually high resolution, as if it’s a plasma TV. I can see my every pore, each hair of the dark heath along my upper lip, and above all, the geological record of my cataclysmic acne faithfully preserved upon my cheeks. Suddenly I’m furious with myself. I can’t believe I’ve lumped Daddy in with war criminals. Savagely, I rip the paper towel from the wall dispenser. I clear my throat softly. “We should probably take him back up, Mom. I’ve got to go home to my laptop. I’m sorry.” Since I’m out of vacation days, I had to agree to do some job-related work in return for time off. “Hear that, Herm? We have to get you back upstairs,” my mother says. “Maybe it’s time for ‘Jeopardy’. Wouldn’t that be nice?” The staff likes to put the program on for the residents each afternoon. I wonder if they get off on the irony. With me driving, we set off for Mom’s in her Cadillac Escalade. I’m fine with having to work. Gives me something to do besides argue with her. It is a sweltering day in mid-July and there are canoes and racing shells on the river. Apart from their fleeting wakes, the greenish water is as still and impenetrable as jade. Suspended in the sky are several hawks --- or vultures, I can’t tell. There is scarcely enough breeze to disturb the leaf-laden trees nodding out over the far riverbank. Even with the air on full-blast, sweat is collecting in the space between my breasts. “Turn it off, Iris,” my mother commands. I ignore her. I am trying to listen. “I’m asking you, please,” she says, and reaches over to switch stations. I intercept her hand, clutching it to me. She needs to hear. “I suppose you’d say that the monkeys wouldn’t ape themselves, correct?” cracks the interviewer. “Are you doing this to torture me?” my mother protests. Am I? I wonder. Admittedly, there is something about Mom that brings out the worst in me. One time, when I was fourteen, I ripped out the Saks and Neiman Marcus tags from her jackets and sewed in labels from JCPenney. I got to five or six of them before she discovered it. I notice I’ve delivered this assurance with my right hand upraised. I let the hand drop, bemused by my own gesture. Was I channeling the Girl Scout I used to be, before Mom pulled me out because she hated mixing with the other mothers? The words might be lost on her in any event. She stares out the window as we hurtle past estates that keep sinking from view behind hills, like whales half-obscured by ocean swells. “Oh, sure, by Morgenfield.” She snorts derisively. Pete Morgenfield was a graduate assistant of my father’s who did a lot of the research for him on his final book, the one that argued for a direct connection between Ronald Reagan’s “Star Wars” initiative and 9/11. They had a falling-out and my father never acknowledged him when the book was eventually published. Morgenfield endured the slight in silence for several years, during which time Dad’s health began to decline, and then, with his own career flagging, he went to the media six weeks ago with an exhaustive comparison of Dad’s books and those of several lesser-known historians. It set off a storm. And then I watch in horror as she unbuckles her seat belt and, straining against the outside air, opens her door part way. Shouting over an ear-pummeling wind, she yells, “I told you, let me out right here.” She seems oblivious to the fact that we are doing sixty-five in heavy, swift-moving traffic. “Mother, we’re on an expressway,” I shriek, worried for a second that she might actually jump. But histrionics are her thing, not self-destruction, and she’s been making such scenes since I was little. When she sees that I’m not taking her seriously, she pulls the door shut and cries out “Damn you, Iris, damn you,” before leaning over and punching me sharply in the arm. “Good God, Mother,” I say, steadying the wheel. By the time I can glance in her direction, she has already struck a stiff, Proud-Mary pose, peering intently at a landscape visible only to people threatened by the truth. In a previous incarnation, I would have forced myself to sound chastened. You can never overpower her, she has too many weapons. But I’m not the patsy I once was. “Mom, I don’t argue with your overall assessment. As a historian, he’s impeccable. But….” I reach for the right words. We slow for a construction zone. In the intense heat, men in hard hats and orange vests are at the side of the roadway, sipping from water bottles. It makes them seem strangely effete. I cannot hide a smirk. The same old Herman was basically a sphinx. “How would you know that?” I ask. Daddy’s taciturn nature was something she and I rarely discussed. I learned early in life that she was not an ally in my fight to squeeze out more of his attention. I longed to make her recognize that he parceled love out to me like an allowance. Even today I’d like her to see this, how in important ways she’s always been like a single parent while he was off somewhere, literally or figuratively. But I know her sore points. And Daddy is the big one. That’s balderdash, and at a certain level she knows it. Whatever glowing things she has to say about their marital life is revisionism. As long as I can remember, he has been no more communicative than the dining room table. “Someday, you’re going to have to face facts,” I say. When someone says something like this, there is no suitable response. I enter my parents’ gated community and follow curving streets with names like “Bookbinder’s Lane” and “Poor Richard’s Alley” until I end up in front of their big English Tudor. I wait for the garage door to finish opening, then baby the enormous SUV forward. But I am not used to its idling speed, and I’m pretty worked up, so I manage to smack the front bumper into the wall leading to the kitchen. I exhale deeply. “Mother, it’s wake-up time. You need to see Dad as he really was.” I don’t know why this is so important to me, but it is. She doesn’t reply, just lets herself in through the kitchen door with a key and a pouty sashay. I set up my computer at the dining room table, but I can’t get any work done. All I can think about is my enigmatic father, and how often I’ve wished to know what was bubbling around inside him. He could have been leading two lives, for all I know. For all my mother knew. It is evening before we are together again. We are facing one another over dinner--- Chinese that I’ve driven some distance to get, mostly out of nostalgia. We used to pick up from the place when I was much younger. It has hit me peculiarly hard to learn that the owner, a ceaselessly happy man who seemed cemented in place behind the cash register, had died. “I’m thinking maybe you should go home tonight,” my mother says, spearing a piece of General Tso’s chicken with a plastic fork. “Maybe, I should,” I reply. There is much to commend the idea, including my fear of what I might say to her if properly provoked: There is a line between being candid and being hurtful, and I’m not sure I can keep from crossing it. Not that a scorched-earth battle would bother her any. She’s quite happy with slashing and burning, but that doesn’t mean I am. After some consideration, I come down on the side of staying. Beneath it all, I still care about her. Far more than I should, probably, but there it is. “I’m not going. You’re stuck with me for the next week,” I say with false perkiness. I pour us some tea. She shoots me a wicked smile. “Well, maybe a spin osteopath,” she says. “You lack what it takes to be a spin doctor.” She drains her tea, clearly pleased with her wit. After dinner, I clean up, while she heads to the living room where some of the world’s most famous public intellectuals have sat, people like Arthur Schlesinger, Jr. and Susan Sontag. When finally I join her on the vast sectional sofa, curling my legs under me, “Law and Order” is halfway over. My parents used to be addicted to the show and planned their evenings around it. Occasionally, they’d make their famous houseguests watch it. This moment of mirth emboldens me and I put my stocking feet on the coffee table, right next to the alabaster candy dish. The move draws a disapproving glare, but I persist. “Can you stand to watch the news when this is over? I ask. “That only stokes it further. Look, resign yourself, I’m staying.” I punctuate my determination by removing my feet and reaching into the candy dish for a jellybean, which I pop emphatically into my mouth. My mother reacts to this by nudging the candy dish away a foot or so. It is her comment on my weight problem. “That’s so not true,” I say, but it probably is. This is the softer side of my mother, the one I have spent my lifetime trying to cultivate. My mother looks at me poisonously. Then she rises and goes to what she calls her “sewing room,” though I doubt she even knows what a cross-stitch is. She returns moments later with a slim volume. It is “The Rubaiyat” of Omar Khayyam. She opens the front cover to a faded inscription written in what was once the rich blue ink of a fountain pen. “He gave that to me on our honeymoon. Can a man incapable of love write something that beautiful? Answer me that.” Triumphant, my mother rises from the sofa and I watch her still-youthful form march out of the room. From the end of the long, white-carpeted hallway I hear a door slam. I know I will not see her anymore tonight. I pour myself a glass of cabernet from the bar and, seeking distraction, snap the TV back on. Then I drink a second wine and a third, hoping to nod off, but I can’t. Picking up “The Rubaiyat,” I begin to leaf through it. My father was right, it is an exquisite book. I reread his inscription. My mother is right too. I’ve never understood him, though it is not for lack of trying. I get to my feet and climb the stairs to his office (I call it “the shrine”), hoping to absorb him somehow, his essence, the undeniable brilliance of his mind and what lies underneath. I sit down at his computer. The glow from the screen is the only light in the room. Ever hopeful, my mother leaves the system on in case he should want to write another book. I go to the Internet and Google my dad, clicking on his Wikipedia entry. The entry calls him, “One of America’s leading authors and thinkers,” and makes only passing and nonjudgmental reference to his current scandal. I remain there in the half-light, my shadow dwarfing the room. I feel like I’m standing on a crag, a wild sea at my feet. The noise of the surf is filling my ears, and along my spine the skin seems to be separating as though something unspeakable is about to emerge. Frightened, I go back downstairs and refill my wineglass before letting myself out the front door and onto the July-bleached lawn. There I stand, rocking back and forth. Most of the windows are still lit in the homes along the block, but with the new moon barely above the horizon, the night sky is primordially black. Everywhere stars are flickering in their sockets as if in danger of going out. I stride across the lawn to the sidewalk and momentarily consider going for a drive, but drop the idea, too tipsy. Overhead, I watch the green-red blink of a descending plane making for Philadelphia International. I try to imagine the nearly two hundred souls who are packed into that tiny penlight a thousand feet above ground and I wonder what they are thinking about. The baby in the row behind them that’s been crying throughout the flight? How they are going to trundle all of their suitcases and carry-ons out to the long-term parking lot? Whether they are spending the final seconds of their lives before a fiery explosion that will scatter their body parts over field and farm? I stumble through the shrubs surrounding the house until I am in the backyard overlooking the swimming pool. The chlorine smell seems to counteract the wine and I gulp it in hungrily as if it is oxygen. Sitting down on the apron of the pool I take my sandals off and let my feet dangle into the water just as I used to do when I was much younger. And a memory comes to me of another steamy summer night by the pool. It is one of the rare recollections I have of Daddy in a paternal mood. I was in middle school by then, and he had already transitioned from writing about America’s distant past to exploring its more recent history. As much to wring the most that I could from this filial moment as to gain any real information, I asked him about the Cold War and living in the shadow of the Bomb. Did he wish that human beings had never unlocked the atom? I asked him if he thought a nuclear war was likely. He had a full head of hair back then and he wore it slicked down, and I remember him running a hand over it front to back as he considered the question. With uncharacteristic patience, he told me about the cautionary specter of Hiroshima and Nagasaki, about the balance of power and disarmament treaties and how the concept of Mutually Assured Destruction made it unlikely that such a war would ever break out. “But we don’t really know that for sure, do we?” I asked, precocious little snot that I was. Another plane passes overhead and pulls me back from my reverie. Tired of the wine, I empty what’s left into the pool and, in the lights projecting from below the surface, I see it expanding outward until it forms a dark red nebula whose fingers keep curling and swirling, as if reaching for something. And I think of what my father had to say on that evening so long ago. It’s taken me a quarter of a century to find out that he was unequivocally wrong. It is possible to destroy the world, Daddy. I can do it with a simple mouse click.